The setting is Tokyo, just before the 1964 Olympics. A girl of about 15, Umi, works at a boarding house owned by her grandmother, cooking every meal for all the guests. Her mother is in America, studying. In the mornings she raises 2 semaphore flags each day in memory of her father, who was a ship captain, sunk in the Korean war. On a tugboat in the harbor, a boy, Shun, sees the flags go up every morning before he disembarks to ride his bike the rest of the way to the same school. Shun publishes the school paper from an old house on the campus used by all the extracurricular clubs — newspaper, archery, philosophy, astronomy. The house itself is a charming, cluttered old place, full of character and characters, and there is a debate over whether to knock the house down and rebuild it, or whether to preserve it. From Up on Poppy Hill doesn’t capture the same magic as other Ghibli and Miyazaki efforts. I like the cluttered house, but it doesn’t capture my dreams like the wildflower fields of Howl’s Moving Castle or the rural fields of My Neighbor Totoro, and many background details feel like shortcuts — something I never felt in a Hayao Miyazaki film. 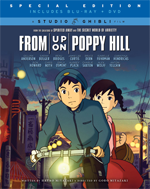 On its own merits, From Up on Poppy Hill is a good animated film, a charmer for adults and captivating for kids. But maybe the son hasn’t quite yet kindled the spark of the father. This release is a Blu-ray/DVD combo pack. There’s one Blu-ray disc and one DVD. It seems like the last dozen Studio Ghibli DVDs were stamped “Disney home video.” Congratulations to GKIDS and Cinedigm for wresting rights from The Mouse. However, students of Disney’s DVDs will recognize many of the extra features. For example, there is a featurette on adapting the movie for American audiences, including footage of the American voice actors in the studio. There is a music video of the title song. And there are features on the real Japanese locations that inspired the locations in the film, all of which are the kinds of things we’ve seen on previous DVD releases. Why mess with success? There are plenty of trailers, and there is a feature that animates the film with storyboards. Gary Rydstrom directed the U.S. adaptation, as he did for The Secret World of Arrietty. He walks us through the cast, from Sara Bolger, who would literally bounce to add energy to the voice performance, through Jamie Lee Curtis whose hidden talent of mimicking a crying baby was used in the background of an undisclosed scene somewhere in the film. I’ve always liked the “Behind the Microphone” feature of the Ghibli releases. Sometimes I’m surprised to recognize a face when I didn’t recognize the voice (for example, Ron Howard as the philosophy club president). It’s always interesting to see the physical acting that underlies a great vocal performance. And it usually reveals just how much care and attention go into adapting the Ghibli films for American audiences. This 17-minute feature, along with the next one, are aimed at people who know, or would like to visit, Yokohama. Goro Miyazaki speaks about finding the right temporal distance to make a period film (1980 is too recent; 1963 is just right). He explains how Yokohama came to be the setting, and how certain geographies had to be changed to make a better look for the film. Miyazaki seems smart, but shy. He looks a little uncomfortable and sounds a little unsure of what to say. That’s less a criticism of Miyazaki than of the interviewers and editors of the feature. I found this feature a little dry. Like the previous feature, this one is aimed squarely at people who know Yokohama. There isn’t a narrator. There are explanatory subtitles. And there is footage of Yokohama from the decade surrounding 1963, cross-cut with footage of Yokohama today. At 22 minutes, this was a long and slow feature with limited appeal. Aoi Teshima sings the movie’s theme song with a full orchestral accompaniment. The video incorporates shots of newsreel footage of old Yokohama with footage from today, and with footage of Teshima singing (she uses her hands to help express the song). The conference turns to the announcement of the theme song. Expressing their thanks and humility are songwriters Yukiko Marimura and Koichi Sakat (who wrote it decades ago — it was used as the theme to a Japanese TV show for a while); music editor Satoshi Takebe; and director Goro Miyazaki. At the end of the conference, Aoi Teshima sings the song (again using her hands) with Takebe accompanying her on piano. The only oddity in this segment is that the questions from the press are shown in Japanese as subtitles, but not translated to English. Luckily, the responses make sense in context. At only 6 mintues, this is the most valuable extra feature. I had a hard time writing my review of From Up on Poppy Hill when it came out because I didn’t love the film like I did most other Ghibli productions. So I felt vindicated and relieved when I saw how ambivalent Hayao Miyazaki was after the credits rolled. He tosses out advice on how to animate walking, he mentions that some background parts seemed weird, and he frankly calls the film an immature effort. He seems vexed at the imperfections, yet he has to balance that with gratitude for the work that went into the film. I’m not reveling in anyone’s pain — far from it, I wish everyone at Ghibli success and satisfaction — I simply feel reassured that I wasn’t the only person who saw Poppy Hill and thought it might have been missing a spark. The digital transfer is impeccable, of course. The colors and detail look great on this Blu-ray disc. It features Dolby Digital 5.0 surround, the best of which is the musical score — mostly orchestral compositions and naive jazz that fits the 1963 vibe of the film just right. The DVD looks almost as good as the Blu-ray, probably because there isn’t much minute detail in the average shot. The only extra on the DVD is the storyboards version of the film. Watch the feature, and at least skim the Celebrity Cast Recording. If you want to know what Hayao Miyazaki thought, watch the Staff Screening Speech. If you’ve ever lived in Yokohama, watch the two Yokohama features. Most of the other features are for die-hards only.